The ultimate On Road resistance training. AIRHub Pro CORE - Ride with friends and family, improve safety, maximise training time. Don't be that guy who always leaves their riding partners behind; at the flick of a switch add extra resistance when you need it. You get the workout you need while remaining on talking terms with your friends. If you are an elite cyclist and are struggling to see improvements in riding or racing performance it is most likely that you have conquered all the challenges in your local area. Just like in a computer game, the AIRhub levels up the challenges as your fitness improves. Turn your local bunch ride into the World Championships by attempting to complete the whole ride on Level 2. New Challenges drive new adaptations. AIRhub is the training tool designed specifically for this. Choose your own wheel builder. Typical build to HED Belgium Plus rim requires 242mm spokes. Designed for riding in all weather conditions with simple consistent operation. A single switch at the axle controls 3 different levels of resistance. No Bluetooth. No Smartphones. Just next level training. The AIRhub Pro is designed to make you a better you. With the slightest increase in resistance you will begin to see monthly gains in average riding power. 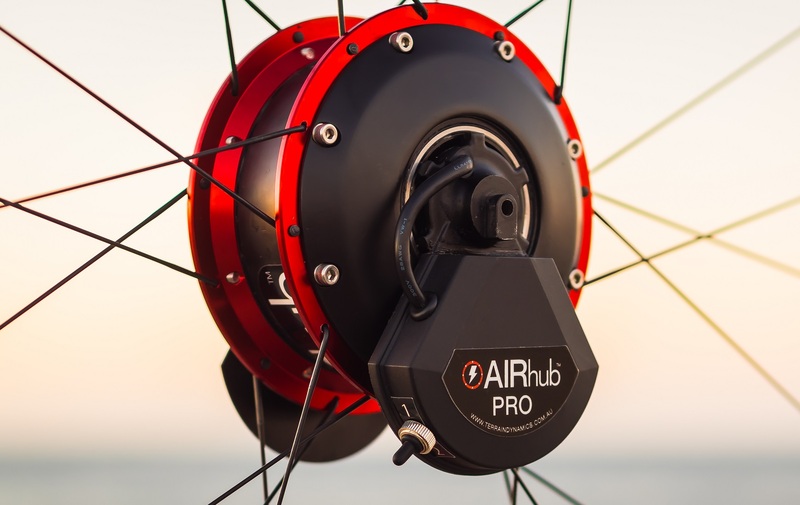 Using the AIRhub significantly reduces freewheeling time and keeps a constant load on the legs. Not only do you start to see training improvements but adding resistance also improves ride safety. Improved road safety means more training in more places. Your local commute just became so much more effective, less time freaking out about cars and pedestrians and more time focusing on the parts of the ride that count.